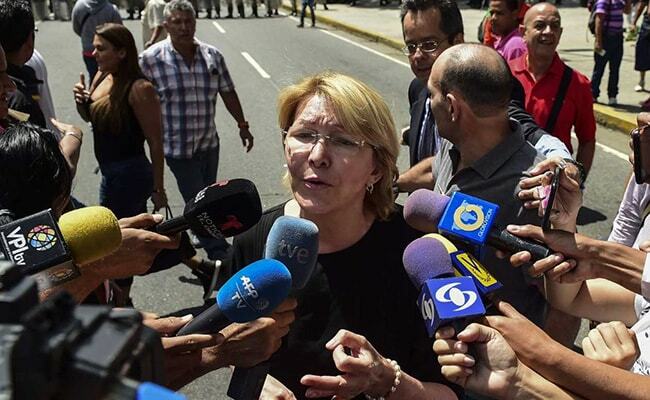 The body, the Constituent Assembly, made the sacking of Luisa Ortega its first order of business since it was elected in a widely condemned vote a week ago. Caracas: A new assembly loyal to President Nicolas Maduro fired Venezuela's attorney general, a vociferous critic, in its first working session Saturday, bolstering international criticism it is supporting a "dictatorship." It also said Ortega would face trial for "irregularities" from her time in office. Ortega, who was barred by dozens of soldiers from entering her offices, said she refused to recognize her sacking, or the assembly's swearing in of Tarek William Saab, the national ombudsman, in her place. Ortega has been a thorn in Maduro's side for months, breaking ranks with him over the legality of the Constituent Assembly. But Colombia, Chile, Guatemala, Mexico, Peru and Canada all immediately slammed the decision, which some called "illegal." "The first action of the constituent assembly has been to further dismantle Venezuela's separation of powers and democracy," Canada's foreign ministry said on Twitter. As Ortega's firing was being announced, Argentina, Uruguay, Paraguay and Brazil declared Venezuela was indefinitely suspended from the South American trading bloc Mercosur for its "rupture of the democratic order." The country's economic and political crisis, he said, is "on Maduro's shoulders," he said, calling Venezuela an "authoritarian dictatorship." The United States, the European Union and major Latin American nations including Mexico, Argentina and Chile have all rejected the Constituent Assembly.